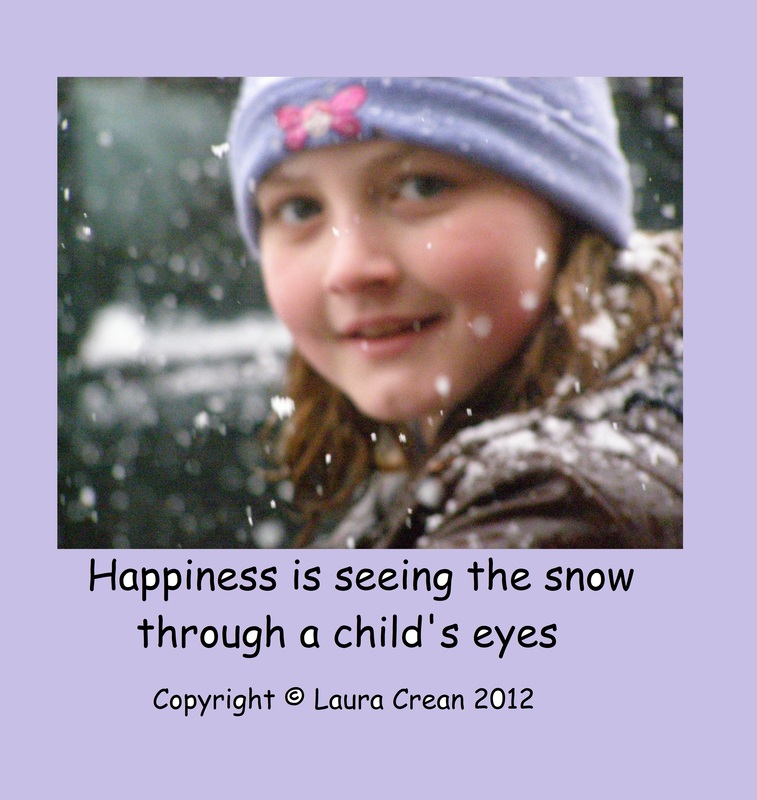 ‘Happiness is seeing the Snow through a Child’s Eyes’ by Laura Crean. It’s amazing what a bit of snow can do to everyone’s mood. It’s freezing and nobody wants to get out of their beds. We all snuggle down under the duvet and delay the inevitable… the alarm cuts the silence, you groan as you turn it off and linger a few more moments in the coziness before rolling into reality and shuffling into a cold kitchen, turn on the kettle and hope the coffee will warm you up that bit more, ready to face the winter world. Eventually the kids make it down the stairs and their gloomy faces just say it all – they don’t want to face the cold either! And then the little one sees the snow falling gently outside the window and her face changes immediately, she lights up like a little snow angel and I can tell right away that behind those bright eyes are thoughts of snowball fights and snowmen! And her enthusiasm is catching, everyone smiles at the thought for a second and then it’s back to the usual winter morning routine of getting ready to go out in the cold, extra layers and winter woolies are dug out and then it’s off into the cold world to start another day. My winter wonderings turn to the beauty of a frosty morning as the tiny snowflakes land on an eyelash and I catch a glimpse of the wonder of nature’s amazing crystaline design up close and personal. The perfection of each snowflake is just awe-inspiring – how can something so mundane as snow seem so magical and lend itself to the wonder of creation itself? God, it appears, in his eternity has found time to hand craft each individual, unique flake to perfection – perfect!